Anabond Rubber Based - Non Curing are non-curing butyl rubber based product containing anti oxidant additive to prevent oxidative degradation of the product during storage. This product has very good adhesion over Aluminium, Steel, Carbon Phenolic, Carbon-epoxy Substrates. Being resistant towards water, this product prevents the entry of the water through the joints. This product does not develop any crack or lose its bonding properties, when exposed to out door weathering conditions such as sunlight, rain etc. 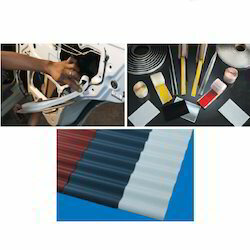 These products are widely used in the Construction And Automotive Industry. 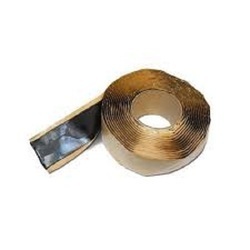 Non-Curing rubber based Butyl mastic tapes are highly tacky compounds possessing excellent peel strength & good adhesion to metal & non-metal with good weathering properties. Sealing joints encountered in Pre-engineered metal building fabrication such as vents, gutters, roof jacks, window tins, door fins etc. Anabond Butyl Mastic Putty is non – curing synthetic rubber based putty that finds application in bulk head sealing on compressor and condenser to prevent entry of water in air conditioner. Anabond Butyl Mastic Putty also finds application as a sealant to prevent ingress of moisture in other applications where good water proofing is required. This is easy to lay without use of any applicator and does not involve any wastage. They are available in white,black and grey colour as per customer requirement. Looking for Rubber Based Non Curing ?